We can write copy. For hours. In fact we do. But this is about what other people are saying about us. Whether that means press (which makes us feel very official) or our members (which makes us feel very special). Take their word for it. "When you think of co-working spaces, artsy and free-thinking Fairfax might not come to mind as a natural home for one. And yet that’s exactly where Steph Harty, founder of The Indie Alley, decided to place hers. This will be the first time that the printed page mentions the new, quaint space—in true Fairfax fashion, the news about it has been spreading by word of mouth." 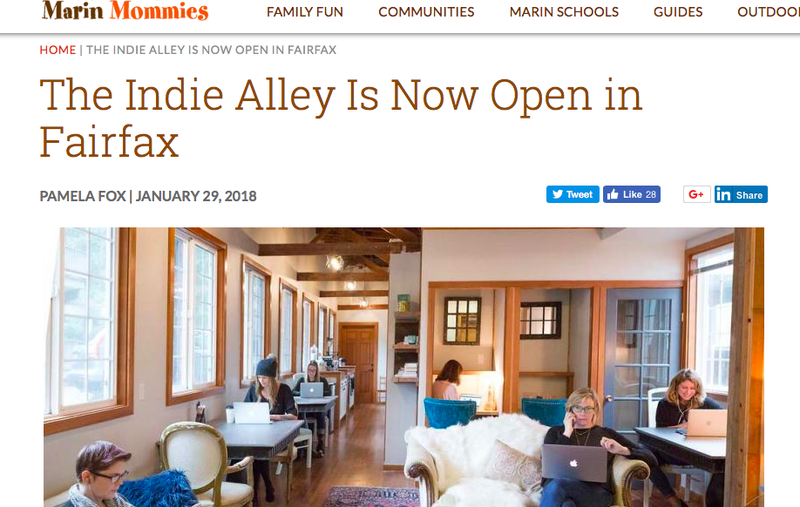 "Downtown Fairfax welcomes a new co-working space, The Indie Alley, for anyone who works remotely, has a small business or needs a creative space outside the home. The space includes private offices, a phone booth, a wellness room, outside seating and a conference room. During off hours The Indie Alley hosts events, workshops and social gatherings open to members (at a discount) and the public. The space can also be rented for events." "I get so much more done here than my office at home or coffee shop! In today's world our work model has shifted from the typical corporate office environment to being able to work from home or collaborative work spaces. So The Indie Alley co-working space is an absolute blessing for North Bay independents and freelancers. And not only is the community here absolutely amazing, but the space itself is entirely welcoming. I love this place! Yes female-focused but honestly as a male this place feels like home to me." "Are you a work-at-home mome living the work-life balance dream? The Indie Alley, Marin's newest coworking and creative space, might be for you. Located at 69 Bolinas Avenue in downtown Fairfax, the Indie Alley is an affordable, comfortable, and flexible space for however you work, whenever you work. Whether that means typing away on a laptop in a cozy nook, working with a colleague in the lounge area, focusing on a solo project at a work table, or stretched out with materials in the maker/ meeting room, the Indie Alley has the space (and free coffee) for you."